Well, once again I find myself writing a blog post well after I had intended to get it posted. 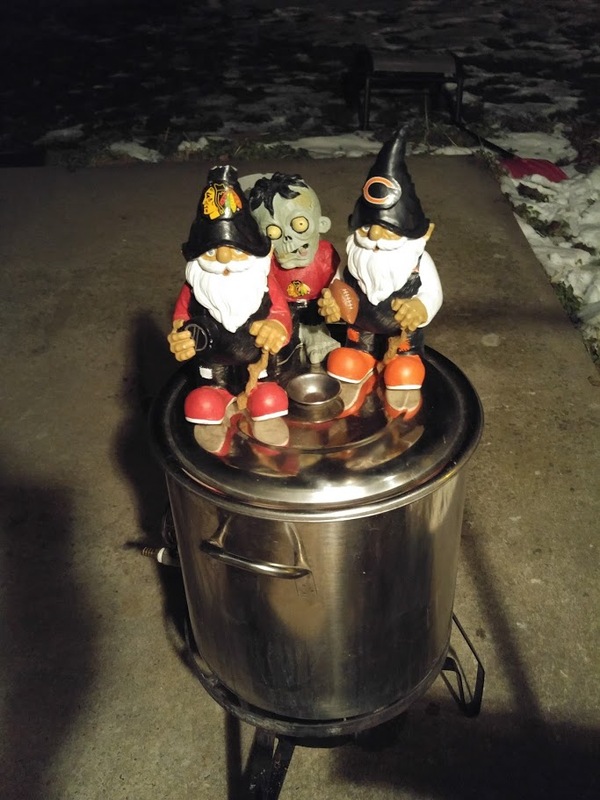 This time, I'm getting to the brew-day post after I have been drinking the beer for awhile. 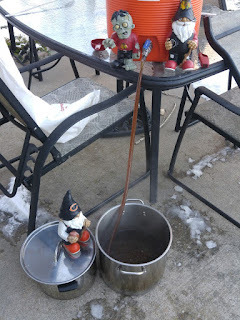 The SheppyBrew Brewery has a tradition of brewing a special Christmas Seasonal winter warmer every year. I started way back in 2009 and have done one every year since. See X-Mas Ales 2009 - 2015 for links to all the recipes. Every year, the beer is pretty big (for me) with dark amber or brown color with lots of caramel malt flavor. 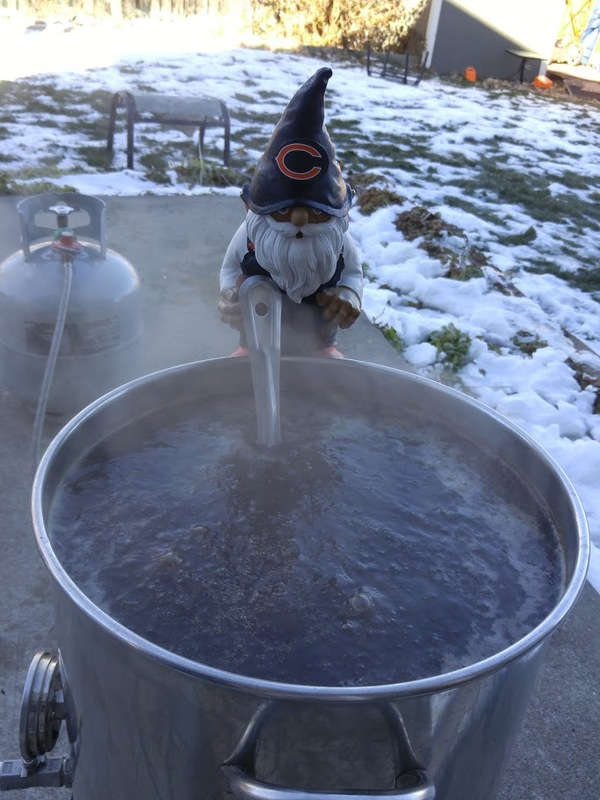 I changed the recipe up every year adding different spices except for the past couple years where I just made the base beer. 2009 was a Mr. Beer recipe with Honey, Cherries, Almond Extract, Vanilla Extract, Cinnamon, and Cloves. 2010 was an all-grain recipe with cinnamon, apple pie spice, and cherries. 2011 was also all-grain with Hazelnut flavoring. 2012 was my wife's favorite using a Peppermint flavoring that made the beer taste very much like girl scout thin-mint cookies. 2014 was just the base beer that I had been making all along. This year (2015), I decided to concentrate on the base beer again. I decided to cut the color a bit, reducing the caramel malts and the darker malts. I replaced some of that crystal with a dark Munich. I also reduced the alcohol a little bit. 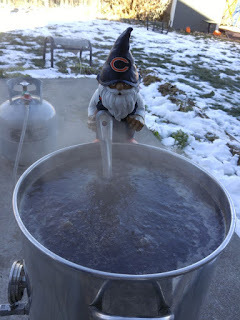 Brew day was over a month ago, but as I recall everything went as it was supposed to. 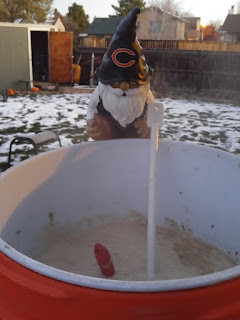 I did have a mishap a couple days into during fermentation. 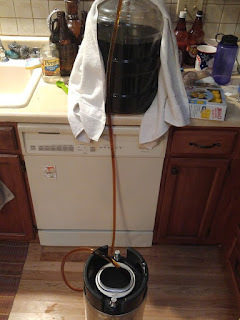 I neglected to put in a blow-off tube and the airlock got clogged enough to pop out (explode out) of the carboy. The mess was the worse I've ever had in the fermentation room (aka the guest room). There are still some signs of yeast on the ceiling of the room. But, the beer was ok, and I only got yelled at a little bit by the beer model. I kegged mid-December and started drinking less than a week later. 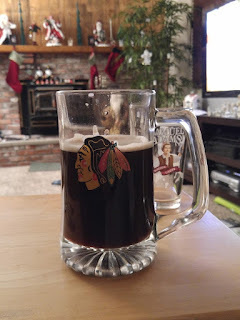 This is the first of my X-Mas Ales that was primarily consumed from the keg. I did bottle up 6 12 ounce bottles to have in years to come. Even though I have been drinking this beer much younger than I usually drink my X-Mas Ales, it has still been a wonderful beer. Without any spices, the malt really shines through. It is still pretty caramally, but not as sweet as I remember last year's being. This a good thing. I might cut the caramel malts more in 2016. It also has a nice chocolate flavor coming through. It is still pretty big at 6.9% ABV, but it does drink fairly sessionable. Even the Beer Model has had more than one pint in a sitting. I still have more than half a keg left. 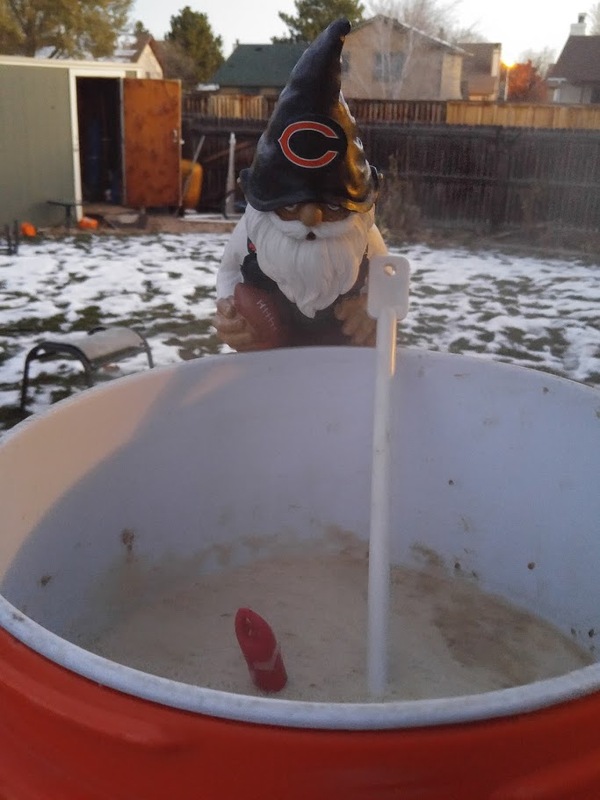 I'm not sure if I'll be finishing the keg before the end of the winter or not. My guess is that I'll finish it, but you never know. I didn't really do any side-by-side tastings this year, but I have tried some of the previous year beers around Christmas. 2015 is certainly my favorite, and I don't think it is only because it is fresher. I think my tastes are moving toward more balanced. And this year's version certainly is. 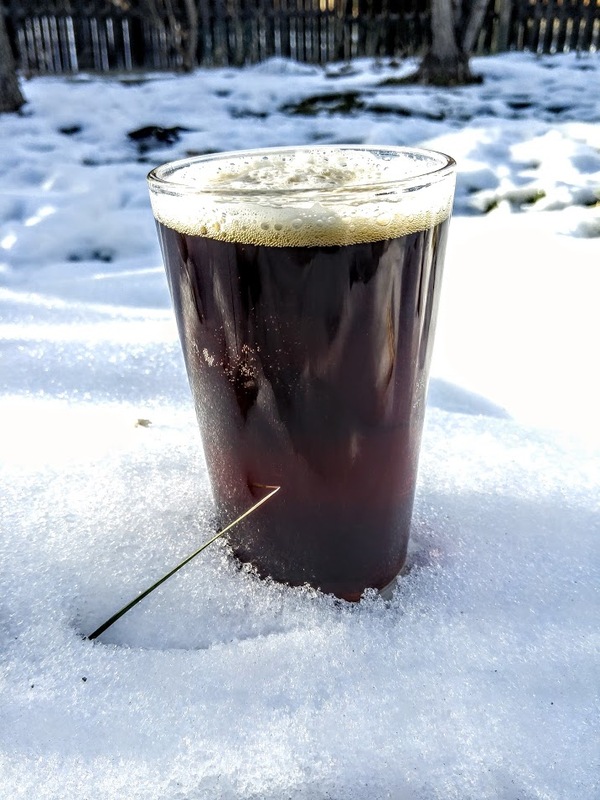 Anyway, that is really all I have to say about SheppyBrew's X-Mas Ale right now. I'll have some more tonight during the Broncos game and certainly drink some on New Year's Eve. Keep an eye on all the regular spots for updates: SheppyBrew's Facebook Page; Sheppy's Twitter Feed; and SheppyBrew's Website. Also feel free to send me a friend request at untappd.